Why Do We Climb Indoors? 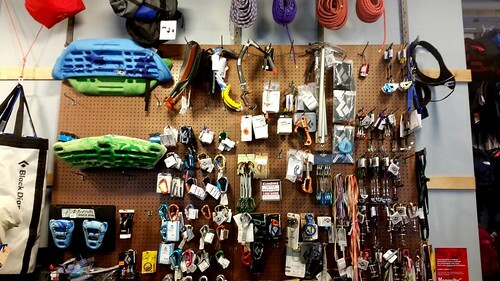 That’s a lot of climbing (and ice) gear for Kansas City! I don’t read Outside, mainly on principle. It’s headlines are made to make you pick it up and turn the pages, and I rarely feel edified for the content. When I finally found the article, which was under a completely different headline (damn it! ), the most hated men turned out to be route setters at indoor gyms. To a greater surprise, I kept reading. I’ve always climbed in gyms, but only recently embraced indoor climbing as a way for me to climb more regularly. Wait, no, accept it is a better word than embrace. I love mountains, not plastic. I get excited about snow and ice, sometimes big walls, but not warehouses separated from valleys and vistas. Still, I was getting into the article. What’s wrong with me? I just got back from a business trip to the greater Kansas City area in the American Midwest, which is one of those destinations that’s known for being flat. I met with a Kansas public official who has spent a lot of time in my home in the Washington, DC area and he said the biggest difference between there and Kansas was how we measure time: In Kansas they talk about miles driven, but in DC it’s about minutes spent in traffic jams. After covering 200-plus miles driving at mostly 70 mph in three days, I got it. As with every trip, I try to squeeze in a little hiking or climbing, and these days all of the climbing is indoors. Still, I have found some interesting gyms. I liked the Great Western Power Company in Oakland, California. I was surprised that the greater Miami, Florida area had one well-kept gym let alone its two gyms. Kansas City has three. The greater Washington, DC area where I live has five. My hometown in Upstate New York only had one (albeit the Adirondacks and Gunks weren’t too far away either, so they probably weren’t needed). I spent time in both the Kansas and Missouri side of Kansas City, but the Climbing Business Journal had an interesting story recently about how Kansas, which is one of America’s flattest states, has opened several indoor climbing gyms. This was a surprise to me; usually gyms open nearby traditional outdoor climbing destinations, so climbers can train regardless of the season or the weather. But the Midwest — America’s heartland — it seemed like a bit that there was something drawing people in that I didn’t understand. I stumbled upon a MooseJaw outfitter by happenstance after a meeting with the local Habitat for Humanity leaders, and saw a peg wall stocked high and wide with ‘biners, cams, slings and even a modest selection of ice tools. It turned out that the previous store manager was a native of Kansas City and he climbed ice. He recently took a promotion and moved to Chicago, but the gear was still prominently featured. It was then that I realized something about geography about Kansas City that I hadn’t thought about from living in Washington, DC — the Colorado Rockies weren’t really that far from Kansas City; less than nine hours away by car. So I found directions to the The Cave. and the instructions on the website said, “Take the elevator down and follow the signs.” The elevator entrance stood alone in a parking lot and the inside had two signs. 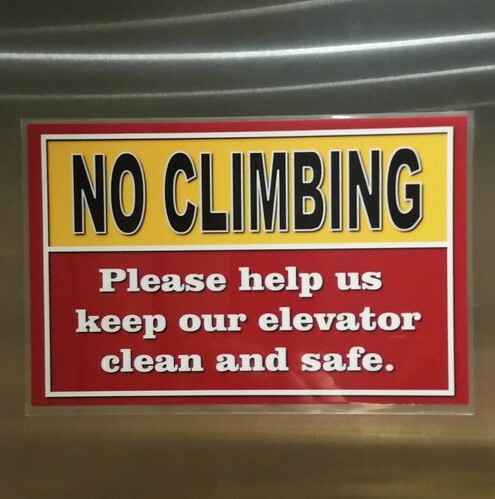 The first you couldn’t miss: “No Climbing: Please Help Us Keep Our Elevator Clean and Safe.” The other was smaller and said something urging riders to enjoy the ride down 10 stories underground. 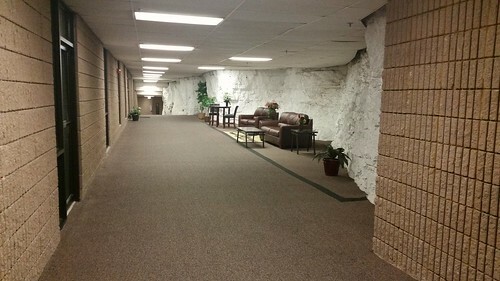 The facility, called Dean’s Downtown Underground, was actually built by Lester Dean, Sr. in 1954 with the help of a lot of surplus government explosives. He purchased land that had an incomplete railway tunnel that was started in 1873, drained it and got to work. The gym had a plastic cave, 14-foot bouldering walls, a climbing treadmill, and a slackline setup. They used the standard V-scale but also had their own “VB” scale for beginners; I think it only went to VB2 before going to V0. I wasn’t too impressed by the 14-foot walls, though they managed to compress a lot of routes in a small space. The cave was the gem. Well padded. Overhanging. And deep; it felt like the cave at it’s farthest point went about 15 feet in, which meant the wall was a ceiling. The best part about The Cave was the other climbers. They were focused, knowledgeable, and very funny. I was about 15-years older than most of them and they even made me feel welcome and comfortable. But, then again, that was how I felt almost everywhere in Kansas City. Just before going to Kansas City, I took family my family apple picking near Shenandoah. Near Front Royal we passed the a warehouse that’s been there forever that has been the local Crossfit gym. It had a new banner this season: “Need a Hobby?” Maybe that was what was wrong with me. I’ve read that climbing gyms are very popular among 20-somethings because of the appeal of the socialization. But I have recognized, that it’s a sport that encourages participation over excellence, even though excellence is a natural goal. It’s also an action sport that requires more socialization and more interaction and trust than say mountain biking or paddle sports. The other thing is the nature of adventure. Yes, you can’t have adventure without the unknown, and the walls in a gym seem pretty obvious. But the unknown is personal performance, and trudging past your own fear. For me, it’s more adventure than I ever got playing soccer or basketball. We need hobbies, and if that hobby offers some adventure… well, maybe that’s what gets us climbing indoors these days.